Our boys loved their Finding Dory breakfast bar but afterwards we had a little time to spare before heading to Southampton for the film. 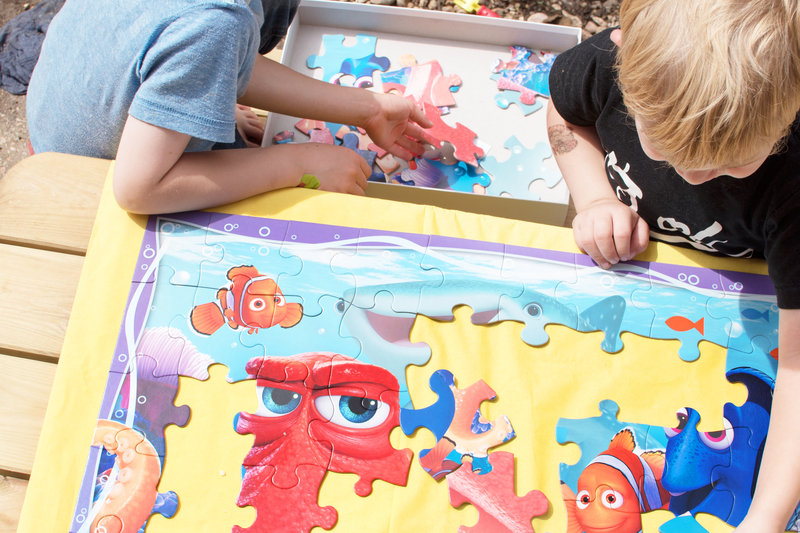 Lucky for us, we’d been sent some Ravensburger Finding Dory puzzles to keep the boys occupied whilst we were getting ready to go. They got started on their Finding Dory puzzle challenge and Jensen tried to create the 3D jigsaw globe with the mister whilst Lyoto and Hero worked together with me to try and make the floor puzzle. 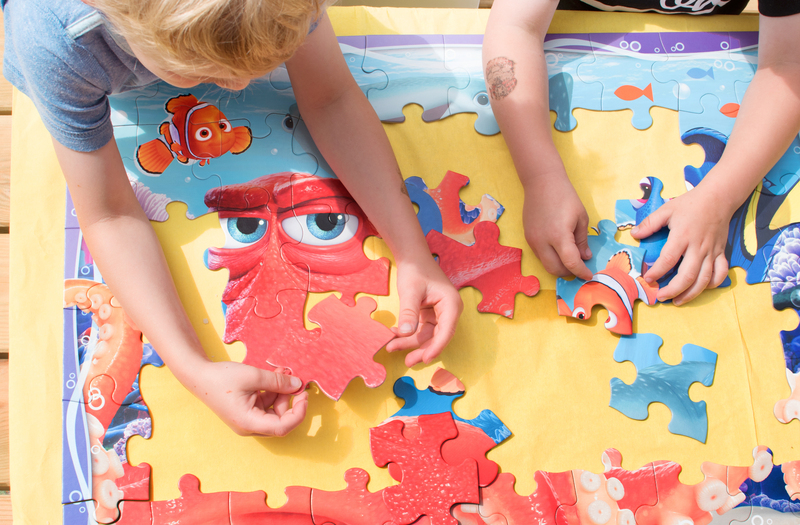 The plastic 3D Ravenburger Finding Dory puzzle was a favourite with the boys initially because they could display it in their room. They love collecting windowsill trinkets and it had pride of place with their little Disney Pop Funko ornaments. It’s a beautiful, bright hard plastic globe puzzle that sits on a display tee and we loved it. When the mister put it together with Jensen and he was ecstatic. However in the hands of little people showing grandparents and friends, it soon became dismantled partially, then nearly completely and was a complete pain to put back together due to it caving in…but I managed it! I wish it was assembled around a polystyrene sphere or something that made it a little more solid. Assembly wise, there are little arrows and numbers on the inside of each piece showing where to place the next bit, or you can use the picture on the outside to assemble it whilst trying to keep it all in one piece. I’ve had around ten of the Disney floor puzzles since the boys were born. Wreck it Ralph, Mickey Mouse Clubhouse, Jake and the Neverland Pirates and Doc McStuffins to name a few. The best thing about them is that the pieces are large and thick, and everyone can join in because there’s enough room for a few little people to move around it without crowding each other out. We’ve lost pieces but they’ve never been destroyed a few have even got wet and still survived! 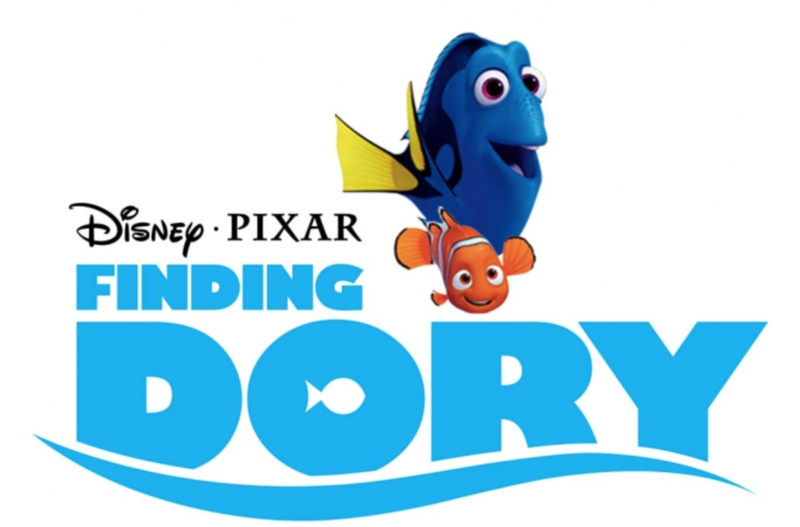 The Ravenburger Finding Dory puzzles are both available in toys stores, and are perfect for a Disney day!